Our selection of foil hot dog bags includes plain styles that can be used to package corn dogs, chili dogs, and deli pickles. You’ll also find styles that are printed to let employees know exactly what is inside of each bag. By using the printed products, you’ll also reduce the chances of serving customers the incorrect order. These hot dog wrappers also allow you to pre-wrap items before a large lunch or dinner rush to help you maintain speedy service. Also make sure to check out other great items from Carnival King and Benchmark USA. 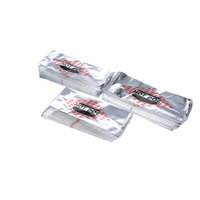 If you operate any type of quick-serve establishment, then these foil hot dog bags are essential supplies for you. By using these bags rather than take-out containers or paper boats, your hot dogs will remain hot and fresh. Plus, our wrappers allow you to place food items in to-go bags for your customers’ convenience. For other great supplies, check out our condiment portion control packs, paper napkins, and pump condiment dispensers. If you're wondering where to buy benchmark usa hot dog wrappers and hot dog bags, we have a large selection of benchmark usa hot dog wrappers and hot dog bags for sale at the lowest prices.